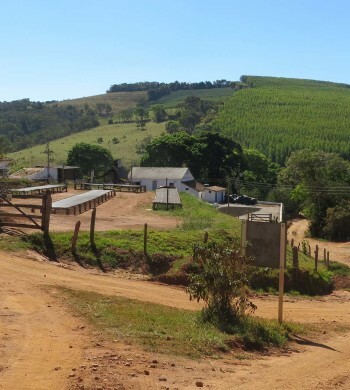 One of the members Estates of Santo Antônio Estates, Fazenda Samambaia has been in the Cambraia family since 1896. The current generation, headed by Henrique Dias Cambraia, is expanding the original holdings and modernizing much of the production and processing. We first met Henrique years ago at an SCAA expo, and told us he came to the event for the sole purpose of establishing contact with Atlas, and building a business relationship with us. It was a nice way to start, and we have been making annual visits and working on sourcing exceptional Brazil coffees through Henrique ever since. Samambaia has recently been doing some experimental lots of hand-picked, small batch naturals–at the opposite end of the spectrum from the mass-produced natural coffee that Brazil is known for. These lots are very fruit forward, with dark grape-like effervescence–a good option for those looking for small lots with unique flavor profiles. Atlas also regularly carries Samambaia’s Yellow Bourbon Pulped Natural, a very sweet, full-bodied coffee with dark fruit and chocolate notes that is excellent for espresso.